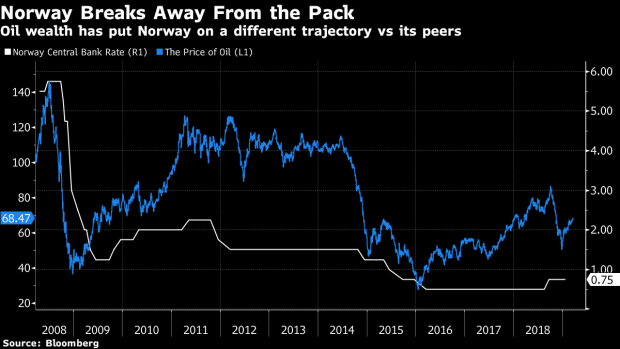 (Bloomberg) -- Norway’s central bank raised its main interest rate for a second time since September as western Europe’s biggest oil exporter lets a rebound in crude prices steer monetary policy. “Our current assessment of the outlook and balance of risks suggests that the policy rate will most likely be increased further in the course of the next half-year,” central bank Governor Oystein Olsen said in a statement on Thursday. Norges Bank, which is based in Oslo, raised its deposit rate by a quarter point to 1 percent, as expected by most economists. The krone soared as much as 0.8 percent against the euro after the announcement, as markets took note of the very different monetary trajectory that Norway appears to be on versus its western counterparts. The picture in Norway is far removed from that in the euro zone and even neighboring Sweden, where central banks have had to take a more cautious approach toward tightening amid mixed economic signals. On Wednesday, the U.S. Federal Reserves signaled it won’t tighten policy at all in 2019, reflecting concerns over slowing growth. Norway’s economy, which is backed by the world’s biggest sovereign wealth fund, is growing faster than a lot of its peers. Unemployment is below 4 percent and inflation is above target. What’s more, the krone has remained weak despite the country’s economic strength, giving the central bank plenty of room to raise interest rates without hurting exports. --With assistance from Nick Rigillo.